It started on Lucy's second birthday--just 12 days after her funeral. We held a very somber birthday party at a friend's home. I had been planning a Peter Pan themed party for my little Tinkerbell, but of course that all went out the window with her accident and subsequent death. Many people still brought presents, mostly gifts for Vic and me--encouraging quotes, beautifully framed photos, books, and the like. One present was wrapped with a gorgeous ribbon and attached to the ribbon was a simple little thimble. Just an average silver thimble from any old fabric store. I didn't get it at first. Why the thimble? Vic is the one (as well as the card inside the gift) who pointed out the symbolism of the thimble to me. I can't imagine there are very many of you reading this who don't know the story of Peter Pan and Wendy and the thimble...the "kiss" that they exchange. Do you remember? Peter gives Wendy a thimble when she asks for a kiss. And wouldn't you know it, I don't even remember what the actual gift inside the box was. But of course I remember the thimble. And thus began my kiss collection. Vic ( as well as a few blog readers!) has given me several kisses since Lucy's death. Each one representing something special and meaningful. And I want to catalogue them on my blog. (I'm sorry if you thought you were getting a list of all the boys I've ever kissed. I am LOATH to admit it...but I actually have one! Yes...I kept a little list in my journal. Ok, it wasn't a little list. It was quite lengthy. Bonus points to anyone who can guess how many. Just kidding. Please don't.) But once again I digress. This kiss is all white. I thought it fitting since this year I would have been baptized--and because you are in a new place with new opportunities to make new choices and try new things. It's a new year to be the best you can be! The whole family! I love you! I still check on you. I'm proud of you! The "day" will be here before you know it. I'm looking forward to sharing more kisses with you all. As cheesy at it may seem, I really feel as if Lucy is communicating with me through these tender letters that Vic writes. I'm not sure how to display all my thimbles, they are a bit in the "grandma realm" as far as a collection is concerned. I think they'd look nice in a shadow box frame but I'm not sure how I'd attach them. Any suggestions would be greatly appreciated! And speaking of kisses, I don't know if you saw my shout-out on Facebook and Instagram...but I'm doing a big Valentine's Giveaway on my blog, including 2 tickets to my opening night of Les Mis. If you have a business/product you'd like to promote by joining my giveaway, please email me! (I get about 3,000 hits per day.) I've got a great package put together so far. I didn't know about the thimble in Peter Pan. What a precious gift. And i love the new white one from lucy, too. Ca-UTEST collection ever and SUCH a sweet sentiment by a sweet hubs! YAY Molly! I love this post! It warms my heart! I absolutely love your blog! You are an amazing woman and such an inspiration to me. Your thimble "kisses" are so cute. What a sweet way to remember Lucy. I found a thimble holder online that looks like a shadow box: http://www.displaycaseco.com/product/item.phpurl=http://www.displaycaseco.com/thimble_displaycases.html&item=68&finishing=175 Hope this is helpful. Best wishes always! simply beautiful. and for the record? your husband is the best. We love the story of Peter Pan in our home. 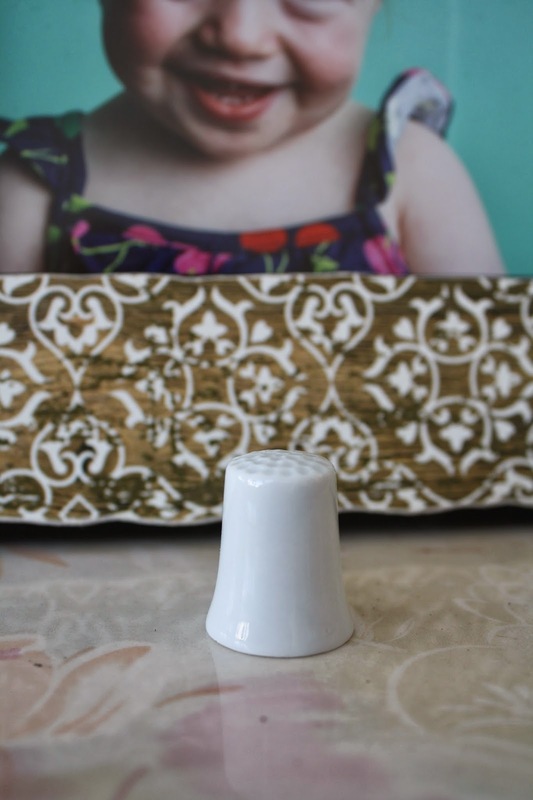 My husband gave me a thimble a few years ago as a gift, and we take turns 'hiding' it in a random part of our house...in a sock folded up in our sock drawers, tucked on a random book shelf, inside a cereal box, etc...when the other person finds it, it is their turn to hide it. It's just a little "I love you" that's sweet to us and special to find. I hardly ever comment, but this one made me cry. White. Baptism. Sweet kisses. Thinking of you. Every day. I've mentioned it once or twice, but our girls share the same birthday, and I think of Lucy because of my own daughter. And I love Em's idea of scattering the kisses throughout the house. Seriously, Ladies. Stop making me cry already!